In 2010 our family moved to India. We had lived in another developing country previously (Kenya) and so it did not seem like much of a stretch. After 6 years in Qatar we were ready for a little more of a “challenge” so to speak. In the months before our arrival in Delhi, my wife and I noticed a lot of discussions amongst the returning faculty and the newbies about dengue fever. I now know this is common every year. Someone asks on the forum, “Dear returning teachers, do I need to bring mosquito nets?” and the discussion turns to dengue within a few replies. 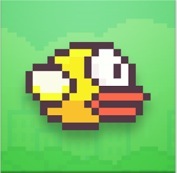 I’ll admit it was a bit of a shock to find that this was a serious disease that many people contract. The fact that many people are out of work for weeks and that some people die made it even scarier. I had not affected my family personally until later that year. My son had been sick for a few days, not extremely sick really, but still, he was sick. Then he added a rash to his list of symptoms. We had heard and seen what it was like to get dengue. 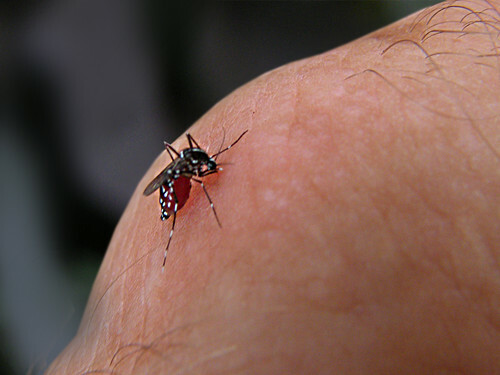 Dengue is sometimes called the “breakbone fever” as your whole body is sore and your core temp is elevated. There’s also a rash that comes near the end of the illness. So we had him tested and sure enough he was positive for dengue. The good news is that dengue is often milder in young children so my son was not bed ridden or sick for many weeks. The worst part of the illness for me was that he had to have his blood drawn daily to make sure his platelet count was okay. When your platelets drop you are in greater danger and they can drop quickly so you have to draw blood from your arm fairly often. I think I failed to mention that my son was 4 years old at the time. If you have ever drawn blood from a 4 year old or you have ever had to assist in blood being drawn from a 4 year old you know how traumatizing that experience can be! In the end he did recover. His platelet count went back up and his happy smile returned. The rash was gone. We could stop the daily blood draw, which made all of us happy! It was during this time that I, like most parents, started doing loads of research on dengue. Specifically I wanted to know how the disease was spreading around Delhi. Scouring the web, I could not find any websites with this kind of information. Printed newspapers are popular in India so I investigated those but the information was spotty there too. They reported an impossibly low number of cases in Delhi, nowhere near what the actual numbers must have been. And there was certainly no map included so that you could see where the cases were being reported in Delhi. Then it hit me. I needed Ushahidi. Ushahidi [oo-shah-hee-dee], which means “testimony” in Swahili, is an online platform for crowdsourcing, with a focus on mapping. It’s a both a website and the platform behind the website Crowdmap.com. Ushahidi came to life in 2008 in the East African nation of Kenya. It was an election year and having lived in Kenya I can confirm that election time means tensions are high. People tend to get very involved and things can turn violent across political parties and tribal lines. That year was no different except that a group of people, led by Erik Hersman, designed a way to help with this issue. The result of some quick thinking was the website Ushahidi.com. It gave the masses a way to report the good and the bad that was happening during the elections and added the benefit of geographically mapping the data (based on the user’s reported location) The Ushahidi team also incorporated an SMS shortcode system so that users without Internet access could still report incidents. Over 45,000 people contributed during this initial Ushahidi “crowdsourced crisis information” effort. The Ushahidi team has since opened up this platform to allow anyone to use it for crowdsourcing information. To date it has been used for things like the Mumbai bombings, Arab Spring, and the Tsunami of 2011 in Japan so I figured why not try it out with Indian dengue? Recognizing that people may have trouble remembering the word “Ushahidi” the group has moved the public website to “Crowdmap.com“. Getting a basic site up and running was simple, but there are a some other bells and whistles that take some serious work. The SMS shortcode option for example means you need to work with a telcom company or shortcode service provider to get a shortcode system approved. Twitter integration requires a developer account on Twitter and you need to create API tokens and get them loaded into your dashboard at Crowdmap.com. Over the course of this project I have configured the Twitter connection, generating the needed tokens and making the Crowdmap.com connection using the Twitter developer account and the API. This means that Twitter and Crowdmap now trust each other and are on speaking terms so to speak. Crowdmap can now follow a hashtag and use the information from any tweet that uses that hashtag as a report/data point. I have also done the research on the shortcode feature and have managed to get some quotes and figure out how that system works. Basically a shortcode allows a user to send a SMS to a number (typically shorter than a regular phone number, thus the name “shortcode”) that contains the required information. More complex shortcode systems work more like 2-way SMS where users can submit a report, then the system replies with a menu of choices and the user replies with additional information such as the age of the infected person, their nearest street name etc. I have not followed through on the shortcode part only because it would cost money and I am not ready to fork out a couple of hundred dollars on this project quite yet. The shortcode service prices start at USD 50/month for a shared shortcode (other clients have the same numerical shortcode and your data is filtered by a keyword you select such as “indiadengue”) to several hundred dollars a month for a dedicated shortcode. In either case any SMS sent to the shortcode system gets routed to your online shortcode portal, then in turn that data gets routed to Crowdmap in the form of a report/data point. If anyone is serious about using Crowdmap in a developing country such as India I feel the shortcode MUST be implemented because so few people have reliable Internet connections. Here’s a basic walk-through of the website I made on the Crowdmap platform. I talk you through the elements of the site and cover a bit of the Twitter integration too. Fullscreen is strongly suggested! Imagine if the use of this tool became widespread across India. Imagine if the thousands of people that were stricken with dengue each year could all easily contribute their demographic information to a central data warehouse. This information could be used by local governments to know where to spray for mosquitoes, where to check for mosquito breeding grounds and large still bodies of water. I firmly believe it would make a significant impact on dengue and reduce the number of people that die each year because of this disease. Dengue must have a huge impact on the workforce as well. Imagine how we could cut down on the number of people that cannot report to work due to the illness. Eliminating dengue could also improve tourism. One less disease in India to worry about for travelers! The case could be made that it would even improve the economy in India due to international business and trade. A healthy country means more outside investors are willing to build in India. The list could go on and on, but I think the benefits of eliminating dengue are gigunda. Now for the tough part, the marketing of the India Dengue Crowdmap. This was where the greatest learning has taken place for me on this project. The tool, the connection to the Twitter API, even the shortcode integration. They are all challenging but pretty straightforward, technical hurdles. It’s the marketing that presents the real challenge. Yes, you can tweet something out, but you don’t want to tweet too much, for fear of the dreaded “unfollow” that results from the mis-use of your Twitter network. No one wants to be seen as a salesperson, even for a non-profit project like this one. It’s true you could create a new account and tweet from there, but they you are starting over on your user base. Then there is email. I have emailed people directly asking if they want to be involved and asking if they knew how I could get in touch with the appropriate people in their area. One person did reply only to say they were too busy right now to work on the project. (I will send a followup email later) I could also just get out there and cold call people (or cold email). In New Delhi I think you may need to go with more traditional means of marketing like newspaper ads and mall promotions. I learned quickly that there is a load of work to be done in order to get something like this to gain momentum. It would take literally months to get a base large enough to make a project like this really come to life. In order to make that happen I think you also need to be passionate and be willing to dedicate time to a project like this. I am passionate, but like many people I am not sure if I can dedicate months to this project in order for it to get off the ground. Also what is needed here is some good market research. Again, it takes commitment and time. I realized as I worked on this project that it is so useful to have someone on the ground who knows the country, city, or community. My knowledge of India is limited. I don’t even speak Hindi and I have only a rudimentary knowledge of Indian culture. If this project were to advance, I would need a local partner who knew how to get things done in India. A perfect example of this would be contacting a local hospital to connect with them about advertising the site at their facility. Without knowledge of Hindi I know it would be tough for me to speak with anyone and communicate my message effectively. Even lack of knowledge of local customs may stand in the way of my progress. It may be useful for me to talk with medical professionals for whom dengue is a part of their daily work. They could certainly offer insight into what types of information we should collect and display on indiadengue.crowdmap.com. They may even put their energy behind the project in terms of utilizing their connections and influence around India. Overall I have learned that as much as I would like this Crowdmap site to just grow organically it appears that it will not. It would take some good old fashioned hard work and a lot of time to get it running well. I’ve just recently had the chance to work with John Nash from the University of Kentucky on design thinking and I cannot resist tying that experience into this project. Admittedly I did not use the design process to create this “prototype”, but I think I could learn quite a bit by applying it. Essentially I moved straight to the prototype, but according to the design thinking (and Nash) the process is not too strict. Essentially that means I can continue to take this prototype and rework it, look at various points of view, deepen my understanding of the real needs, etc. In the end I learned (and will continue to learn) quite a bit from this project. Yes I had to learn how to use the toolsets. The Twitter API piece was particularly fun to learn and work on over the last few weeks actually. But I think the biggest take-aways for me are about the difficulty of marketing and the human element. The more I got into this project the more I realized that I need to know more about my target audience and really, truly learn how this disease affects India. I also need to know my market and get some help with strategies to help get the site some traffic. Tweeting is not enough. I need local connections and methods to get the Delhites to see the value of the site and even to understand how crowdsourcing works. It’s been a fun ride, and I may try and take Dengue in India to the next level, but I will have to take a serious look at my time and see if I have it in me to continue the work. Meanwhile I will continue to tweet about it and look for ways to get the site publicized. At least if you happen to get dengue yourself, you know where to go: our crowdsourced Dengue in India website! This is a video about some of the fun things people do in Minecraft. It’s called “Minecraft Happiness” because Minecraft makes people happy. This NOT the real David Beaty! A few years back if you did a Google search for the terms “David Beaty” you would see an author by that name and me, the “real” David Beaty. Today, when I Google myself, I see the author and another David Beaty who has, over the past two years, been working as a Texas A&M football coach. Of course, he was alive a few years ago when I had his “spot” in the first page of Google search results, and in fact he was coaching other college football teams in other states. There is one major difference however; his new employer (Texas A&M) clearly has a strong online presence. They post a massive amount of content online. Like an increasing number of institutions and companies, they may actually require their coaches to have a social media profile in addition to the regular content the school publishes. They may have a social media consultant or even someone whose full time job is to manage web presence for their teams and coaches. 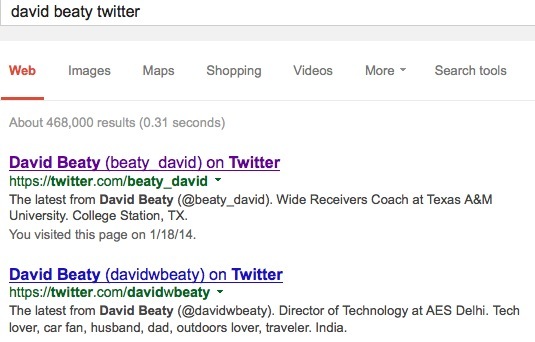 This “other David Beaty” also may have taken a personal interest in social media. Perhaps during his job hunt (before the Texas A&M job), as people recommend, he investigated and improved his digital footprint. Whatever the reason, I, the “real” David Beaty, have been demoted to the world of “not-the-first-page Google results” where no-one bothers to look. Honestly I thought I was doing it right. I am on most of the social media sites, Pinterest, Twitter, Facebook, LinkedIn, Instagram and others. In fact I even own my domain (davidbeaty.com) and have claimed davidbeaty.wordpress.com, etc. Many years ago I tried to claim davidbeaty@gmail.com, but without any luck, so I went with my second choice, davidwbeaty@gmail.com. My point is I do technically own my “digital space” in some of the major social media websites, but it is not enough. Increasingly I am realizing that to bolster your digital footprint you need to actually get your name mentioned and your content distributed on the web. I’ve come to this conclusion because that is the one major difference between the “other” David Beaty and me, the real David Beaty 🙂 Because of the size of Texas A&M his name and images get published frequently. It’s not that he simply owns his “name space”. It’s the sheer volume of content out there on the web related to him. Let’s also keep in mind that different search engines have vastly different results. I had assumed, as many people do, that Google may have slightly different search results than other search engines. I also assumed that “slightly different” also meant “slightly more”. With these assumptions in mind you can see why I was surprised to know that Yahoo has me on page one. That’s right I am on page numero uno of Yahoo search results for David Beaty. In fact, if you removed the ads and image search results I am the 4th hit on Yahoo! The same is true on Duck Duck Go: 4th from the top. I am also learning that Google does not serve up as much social media results as I would have guessed. Many of the top hits are not Facebook or LinkedIn or Pinterest or Instagram pages, they are basic web pages (Twitter does seem to be on the first page of results fairly often). This may be due to the fact that Google has a harder time getting into those pages to do deep searching, or it may be related to the fact that Google has it’s own social networking site, Google+. I suspect a little bit of both factors are at play. How can teachers and students benefit from my experience (aka my demotion to page X of Google’s search results)? The message for students and teachers here is that it is not enough to own your digital name plate, you have to have content. It’s obvious to me that I need to do more than just own my own domain and have accounts on social networks. Own your domain (ex. davidbeaty.com) or something that represents your “brand”. Create accounts on social media websites like LinkedIn, Facebook, Pinterest, Twitter, blogs, etc. Get your content out there on as many platforms as possible. This may mean that you use a tool like IFTTT to double or triple post your content. For example, when you tweet something, you can simultaneously post that tweet to your WordPress blog and update your Facebook status with the same content. Be careful, you don’t need to overdo it and sometimes a tweet just does not work as a blog post, but it does multiply your content very quickly and search engines care about volume of content! Post content often. 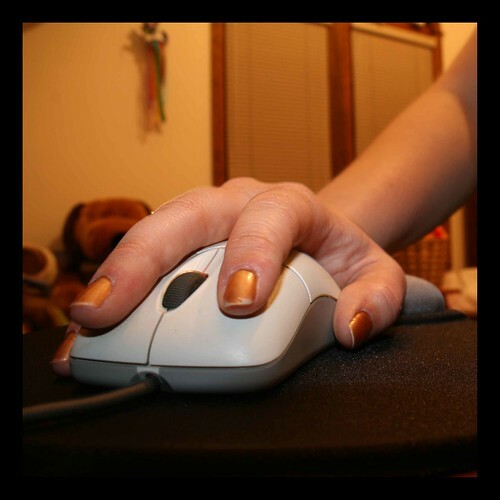 If you don’t do it someone else will and they will control your web presence. 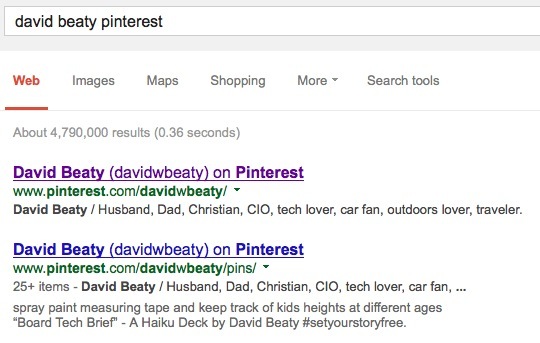 David Beaty Pinterest – Google Search – This one is the real me!